1 Combine 1/4 cup Hellmann's® or Best Foods® Real Mayonnaise with wasabi in small bowl; set aside. Combine tuna, green onions, celery, soy sauce and remaining 1/4 cup Mayonnaise in medium bowl. 2 Evenly spread wasabi mayonnaise on rolls. 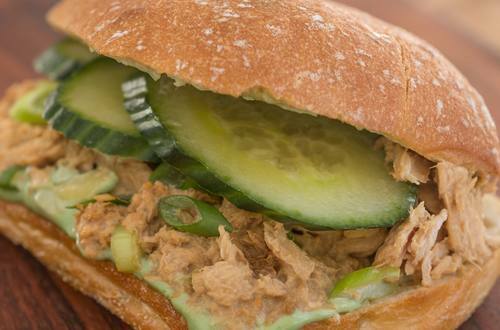 Evenly top roll bottoms with tuna salad, then cucumbers and roll tops.